Average word happiness scores were calculated for each of the fifty states based on tweets. 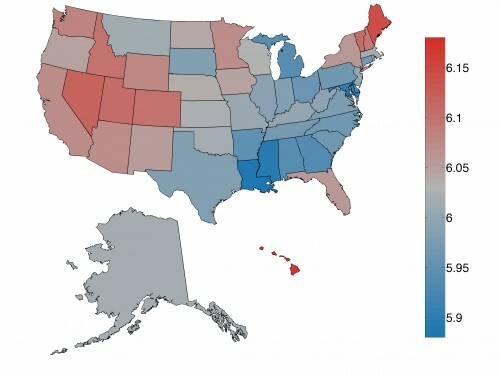 A map displaying the variation in these scores shows the geographic trends in happiness levels across the United States. Courtesy of Lewis Mitchell. Every day, millions of new status updates are posted on Facebook. Twitter is flooded with hundreds of millions of 140-character tweets. What if we could use this sea of information to learn more about the internet users behind it? Researchers at the University of Pennsylvania and the University of Vermont are finding ways to take advantage of the data that social media offers to gather information about human nature. Using innovative approaches to data analysis and psychology, their results have shown surprising correlations between our online presences and real personality traits. Various words and phrases from Facebook statuses can be used to identify differences between introverts and extroverts, or between neurotic and emotionally stable people. Courtesy of H. Andrew Schwartz. Members of the Computational Story Lab at the University of Vermont have chosen to tackle data from another social media giant, Twitter. Researchers have analyzed the linguistic data from over 10 million tweets from 373 urban areas in the United States and determined the level of happiness associated with words in the tweets. Based on a list of 10,000 commonly-found words in the English language, each word was given a “happiness score” by crowdsourcing opinions from the users of Amazon’s human intelligence marketplace, Mechanical Turk. The scale of 1 (low happiness) to 9 (high happiness) ranges from words like “earthquake,” with a score of 1.9, to “rainbow,” which scores an impressive 8.1. The results of the University of Vermont researchers’ analysis created a remarkably thorough picture of the American people’s happiness. The features on a map generated by this data correlated with national census data, with some of the saddest areas corresponding with high poverty rates and low life expectancy, indicating that Twitter information is a surprisingly accurate tool to measure wellbeing. Looking for happiness? Go west. Four of the happiest states included Colorado, Utah, Nevada, and Idaho, while California was home to many of the happiest individual cities. 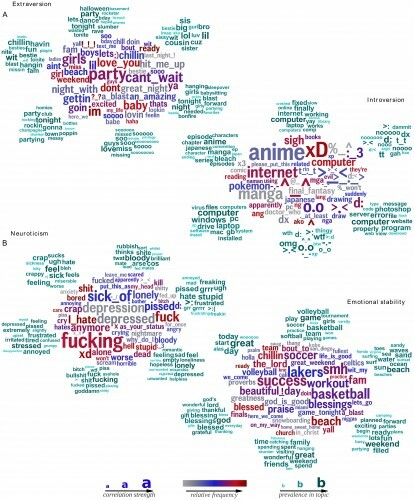 The Hedonometer (www.hedonometer.org) graphs changes in average happiness based on key words in tweets. Daily data is available for dates beginning in September 2008 and is continually updated. Courtesy of Peter Sheridan Dodds. University of Vermont researchers are also maintaining a website featuring a “Hedonometer.” Derived from the Greek words for “pleasure” and “measure,” the Hedonometer measures the happiness of the nation. 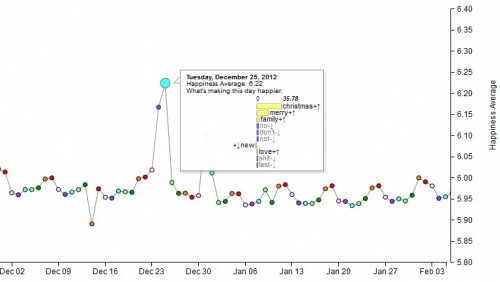 The website plots the daily happiness average for each day’s Twitter posts. Data from as early as September 2008 show a noticeable oscillation between happier weekends and less happy weekdays. Peaks occur regularly, often on holidays. Low points, on the other hand, seem to correspond to specific events. Deaths and tragedies were a leading cause of dips in happiness; Michael Jackson’s death in 2009 and the Newtown shooting in 2012 featured some of the sharpest decreases in happiness. A notable quality of these studies is the new approach to psychology that they adopt. The typical methods used by researchers to probe into the minds of subjects are not always entirely effective. Subjects may remain reserved and not reveal the true thoughts running through their minds. However, by analyzing subjects in the environment of social media, researchers are able to inconspicuously observe as the subjects freely express themselves without their usual restraint. This unfiltered stream of consciousness may be one of the richest sources of psychological data that researchers are able to access. This excerpt from the Hedonometer displays happiness averages from December 2012. The dramatic peak occurring on December 25 can be explained by the linguistic data, which shows peaks in the use of the words “Christmas,” “merry,” and “family” — words with high happiness scores. Courtesy of Peter Sheridan Dodds. Professor June Gruber, director of the Positive Emotion & Psychopathy Lab at Yale, has witnessed firsthand the revolutionary effects of social media. “Social media opens up completely uncharted territory for exploring social connections across the globe, and in rapidly transmitted social exchanges,” she said. “We have been using Facebook as one candidate example to explore the nature of friendship formation and well-being at the global level for the first time across billions of people. Social media is changing the landscape of what questions we can ask as psychologists and the breadth of data accessible to answer those questions.” The recent studies at the University of Pennsylvania and the University of Vermont have illuminated the elusive human psyche in unprecedented ways. This research is using modern methods to answer age-old questions about psychology and will certainly open new doors into the human mind. Aparna Nathan is a freshman in Trumbull College. She intends to be a Molecular Biophysics & Biochemistry and/or Applied Mathematics major. The author would like to thank Dr. June Gruber for her correspondence and insight.